I belong to a book group with so many wonderful ladies. We meet the first Wednesday of each month September through May. We have been discussing and sharing book ideas for about 11 years. Every September we have our book group in Jennifer’s incredible garden. We sit under her apple trees with a view of her cutting garden. Instead of reading and discussing one book she chooses an author we focus on. Over the summer we read as many books as we can by this author. Last year we did Agatha Christie. This year was Mary Stewart. I read Nine Coaches Waiting. It was a great mystery, thriller that took place in a chateau and mountain village in France. A few years ago I read Rose Cottage and enjoyed that one too. 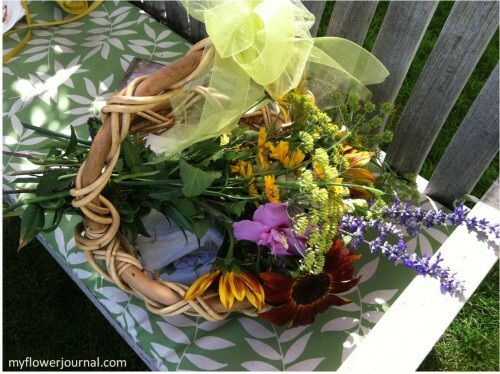 After discussing the book, visiting and eating delicious refreshments Jennifer pulled out a handful of scissors and we all got to go into her cutting garden and cut a beautiful bouquet of flowers to take home! Good friends in a garden discussing great reads-a near perfect fall morning! Bouquet I made from the flowers I picked last year! Bouquet my Aunt Jane picked. She brought this basket full of brownies, then used it to carry her bouquet home. Here is a few of my favorite books we have done over the last few years: Magic of Ordinary Days, Goose Girl, Wildwood Dancing, The Winter Sea, Skipping Christmas, These Is My Words, Light on Snow, Desiree, The Tale of Holly How, Pope Joan. I could keep going , but maybe I’ll save some for another post. We’ve done so many good ones its hard to share them all. Sometimes in January we have a theme we follow. One January everyone brought their favorite cook book and made a dish from it to share. Another January we shared favorite picture books. This has been a fun January tradition because sometimes its hard to get a book read in December for the first Wednesday in January. Oh I LOVE books – and I love flowers – what a beautiful way to spend the day!!! And what a beautiful way to celebrate – giving every one scissors to make their own bouquets I just love this idea!!! It is a wonderful tradition to have September book group in Jennifer’s beautiful garden. A great way to start the fall season and the beauty of her garden is something else!! Your Book group sounds wonderful. Love the book recommendations. Such a lovely setting to be able to sit under the apple tree and pick flowers, lots of joy there. This sounds interesting and those books are good recommendations – I have read a few. I may start a group like this in my garden but instead of going out and cutting bouquets, I will have them go out and pick weeds to take home. Sounds magical! A cutting garden! I love this. Thank you for such good book ideas, too. I need some new reads! Beautiful post. Love the flowers -sounds like you have a lot of fun with your book group~I’m starting one next month and need some ideas! 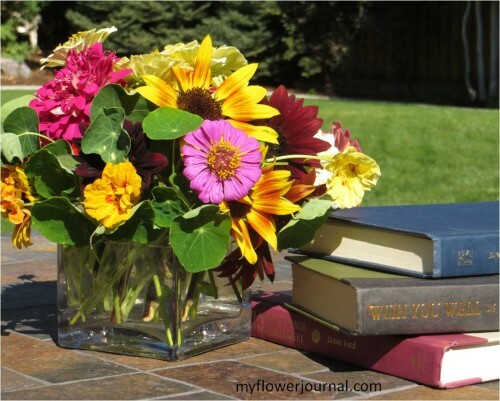 This is a great post, Tammy, it has two of the things I love, flowers and books! I’ve never been in a book club, I did join Goodreads online recently. And I like to talk about my reads on my blog. I think it’s fantastic the way you gals meet and how neat that is that Jennifer lets you make a bouquet after your meet up! Very pretty! So glad to “meet” you! Just discovered your blog and hope to start some painting projects. Really like your style of art and feel like it is somewhat within reach of my abilities! Read some of the books you mentioned. I have read all the Mary Stewarts, more than once! Have you read Madame, Will you Talk? Excellent! Also, there are 2 sequel books to These is my Words that are very good. Two other books I just completed that are now high on my recommendation list are Corelli’s Mandolin and Call the Midwives. These are excellent literature, worthy of book clubs with morals!